Yesterday in San Juan, Puerto Rico Jen Rhines finished 10th in a loaded field for the World's Best 10K road race. Jen ran 33:26 and won $1,000 for her efforts. At 35 years of age, Rhines shows no real sign of slowing down -- she was at least 7 years older than the next two oldest runners ahead of her. When her career is over, she will go down as the second most accomplished female runner ever to have worn a Villanova singlet, behind only the incomparable Sonia O'Sullivan. Here's the top 15 female finishers, with their overall finish in the race. 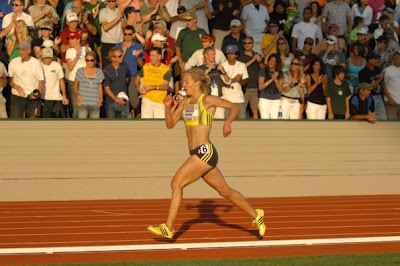 Jen was the first American female finisher.